This workshop explored a range of portrait themes relevant to the North East region; contemporary practice, historic collections, museum acquisitions and learning programmes. The following are synopses of the presentations. In his welcome, the Bowes Museum director Adrian Jenkins drew attention to two recent portrait acquisitions made by the Museum; one of an unidentified woman by Paul Helleu (1859-1927) painted on ceramic c.1885, and Portrait of Marguerite Moreno (The Autumn Bride) by Lucien Levy-Dhurmer (1865-1953) c.1896. They illustrate the acquisitions policy at the Museum, which is to collect items which might have appealed to the tastes of its original founders John and Joséphine Bowes. Chris explored his photographic series Northern Exposures documenting a variety of outdoor pursuits in the North East region, which was published in 2007. It developed over a period of 3 years of visits to the region, with which Chris has been very familiar since childhood. Starting at Haswell Plough Mart, Chris made contact with many of his subsequent sitters who invited him along to hare hunts, shooting parties, trotting events and lamping excursions (rabbit hunting). Chris noticed a recurrent theme of the relationship between people and animals being at the heart of a range of subcultures such as pigeon fancying and ferreting. Chris detailed how the resulting thousands of images were edited for publication into a narrative format with accompanying text. He encouraged delegates to consider the genre of portraiture as including depictions of a community, or even a nation (e.g. Robert Frank, The Americans, 1958), as well as the more conventional definition of the genre. Elizabeth took a fresh look at the magnificent collection of portraits at The Bowes Museum itself. She chose four female sitters, exploring their use of portraiture, and suggested a more humane and empathetic method of interpretation. Infanta Isabella (1566-1633) was sister to Philip III of Spain, and married her cousin Archduke Albert of Austria at the age of thirty-three. Together they ruled the Spanish Netherlands from 1601, reigning over a period of cultural prosperity in the region, Isabella continuing as Governor after her husband’s death. Elizabeth highlighted a range of portraits of this capable ruler, that at the Bowes being a contemporary copy after an official image. Elizabeth’s second sitter was Mariana of Austria (1634-1696), who was married to her uncle Philip IV of Spain at the age of fifteen. The most famous portrait of her is by Velázquez (Prado), which palpably depicts the teenager’s misery in the Spanish court. On her husband’s death in 1665, Mariana ruled Spain as Regent on behalf of her three year old son Carlos who suffered from physical disabilities, the result of generations of Hapsburg in-breeding. As a widow, Mariana was required to adopt a nun’s habit, as is shown in the portrait in the Bowes collection by Claudio Coello (1642-1693) (above). Marie Thérese (1778-1851), daughter of the ill-fated Louis XVI and Marie Antoinette, was Elizabeth’s third sitter. She traced Marie Thérèse’s traumatic adolescence during the French Revolution, and subsequent dynastic marriage to her cousin Louis-Antoine, duc d’Angoulême. Her portrait at the Bowes is dated 1817, two years after Napoleon’s defeat and the restoration of the Bourbon dynasty. The final portrait was that of the actress Joséphine Benoîte Coffin-Chevalier (1825-1874) by Antoine Dury (1819-c.1877) dated 1850, painted during her early relationship with John Bowes, and prior to their marriage. 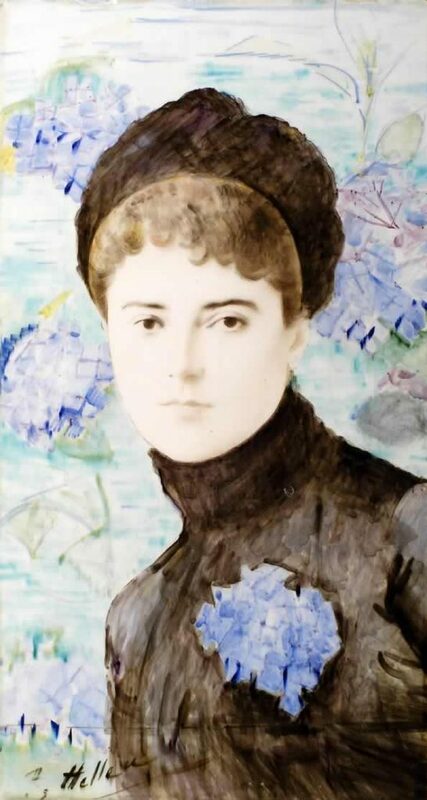 Elizabeth concluded with an array female portraits which form a subsection within the Bowes portrait collection – ladies in remarkable headgear – probably collected by the fashion-conscious Joséphine Bowes. Pauline and Amy discussed the various programmes available to school groups visiting the Bowes. They led the delegates through a typical school visit working with the primary collection in the galleries in the morning, demonstrating how a portrait, for example that of Joséphine Bowes by Antoine Dury (above) can be discussed with a school group, encouraging the pupils to explore and interpret various elements such as facial expression, props, clothing, scale and artistic techniques. The afternoon is typically a practical session in the Museum’s newly refurbished Education Vault, using techniques such as clay modelling, collage, watercolour and printing. The Bowes has also tailored programmes designed for older pupils, teachers, toddlers, after-school groups and specialist art history tours. Sophie outlined the history and remit of the The Art Fund, which relies solely on its 80,000 members for revenue. The Fund receives about 200 grant applications each year; those under the Small Grants Scheme (max. £5,000) follow a simplified process with a rapid turn-around, while large applications are considered by the Fund’s Trustees. The Fund can also respond to time-sensitive applications, usually where an item is offered for sale at auction. Sophie then explored the practical steps involved in making an application, and recommended calling the Grants team at an early stage to discuss a potential application. The Art Fund also acts as a conduit for gifts and bequests, selecting the most appropriate home for any particular object. For this Sophie is keen to hear from collections as to their areas of interest, in case a suitable item should be entrusted to the Fund. Sophie provided case studies to illustrate the range of portrait-focused items secured by the Trust in the past decade, and now housed in the North East region, for example William Powell Frith’s Portrait of Annie Gambart, c.1851-2, now at the Mercer Art Gallery, Harrogate; Ernst Neuschul’s Messias, 1919 at the New Walk Museum and Art Gallery, Leicester; and Bernini’s Portrait of Nicolas Poussin, 1625-8, at York Art Gallery. Harry gave a brief history of Raby’s fortunes since the twelfth century under the Nevills and, since the 1620s, the Vane family. The collection of chattels at Raby includes about 150 family portraits dating from the seventeenth century to the present day, and Harry introduced examples by artists such as Van Dyck, Lely, Garret Morphey, Kneller, Dahl, Vanderbank, Amigoni, Batoni, Reynolds and Hayter, amongst others. Alongside this collection of family portraits are two collections of national significance. The first is a group of portraits of figures from the Restoration court, such as that known as Louise de Kéroualle, Duchess of Portsmouth (above), Barbara Villiers, Countess of Castlemaine, both by the studio of Lely, and Charles FitzRoy, 2nd Duke of Cleveland, (1662-1730) by Dahl, whose daughter Grace married into the Vane family. The second group was collected by William Pulteney, 1st Earl of Bath (1684-1764) and inherited by the Vanes in 1805. Amongst this group is a whole length of Frederick, Prince of Wales (1707-1751) by Jacopo Amigoni, whose mistress was Anne Vane (d.1736), and Sir William Bankes (1751-1800) of Winstanley Hall by Batoni. Another treasure in the collection is Richard Cosway’s miniature portrait of Katherine Lowther (d.1809), which she presented to her fiancé General Wolfe, (1727-1759), the ‘hero of Quebec’. Harry and Clare then discussed some of the issues specific to collections of this kind; the importance of the visitor’s route through the Castle in determining the picture hang, in order to clearly demonstrate the family lineage. Wall-mounted interpretation is deliberately eschewed in favour of room cards and guidebooks, to maintain the ‘family house’ atmosphere. And the castle’s room attendants provide both security and information on the castle and its collection. They concluded with a brief discussion of their conservation programme.